Can you believe it is already nearing the end of October! GEESH, time is just flying! 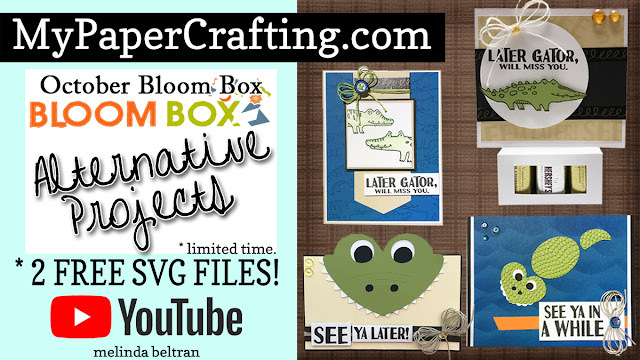 Today I am sharing the four cards I made that are the alternative projects to the October Bloom Box kit. Here is my finished card.I used an A2 cream base. I also used that same cream paper with the same cream cardstock. It measures 2x5. You can see the video to show how I cut the point. I colored my gators with some Spectrum Noir Watercolor pencils. Here is my second card.The finished size is an A2 and the base is black cardstock.I trimmed the white cardstock mat at 4.25 x 5 3/8 and then my blue mat came from the left over paper from the first card kit. For my fun little gator, I used some oval and heart dies. I also used a couple of hole punches and I used a scallop punch that I had. If you don’t have these, then you can get some that FSJ sells. I also used a gator skin embossing folder I had in my stash. For this card-little treat box, I used the white card base that came in the kit and then used some black and cream cardstock. I stamped the see ya later sentiment all around the cream back and then cut a strip of black cardstock for a border. I lined the top and bottom with some of the washi tape that you can get as a bloom benefit. I then used the circle die cut that came in the kit along with stamping the gator like the kit and the white twine. The little gems are from the other kit. Here’s a shot of the SVG file I created to go along with this. The video shows you how to make the box manually with the score board but if you have a craft cutter, you can use the file. I am sharing it for FREE for one week only. You have to get it on my You Tube Channel. Here is my fourth card.I thought it turned out super cute! I created the base from some black cardstock and then cut out some cream cardstock for the base. 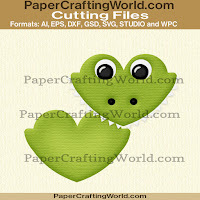 I then designed the little gator head SVG and then cut him out. I cut a strip of dark brown paper for a little border and then stamped my sentiments. I cut the sentiments apart as they come stacked. I then used some of my Journey Natural Twine to create my bow. The cute little embellies are some dew drops from the Robin’s Nest. I am also sharing this SVG with everyone for one week only on my You Tube Channel. You will find the links in the video info-description below the video. and like the video. I would appreciate it so much! Well, that about covers it for today. As always, thank you so much for stopping by and sharing your crafty time with me! Until the next time, have a wonderfully crafty day.